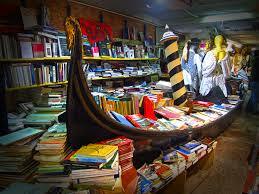 Tell me a Venice, Italy secret few know about. If you are a book lover, here’s a secret you are going to love! 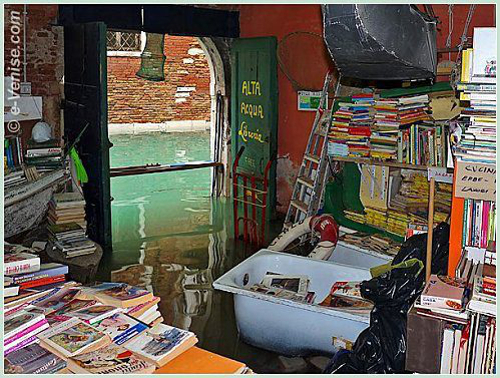 Libreria Acqua Alta, Venice, Italy: The translation is “library of high water.” It’s spread out through various rambling rooms; one room with a gondola stacked with books, other rooms are packed with rowing boats & bath tubs full of old second hand atlases, dictionaries, art books, biographies and history books. There’s something for every one, you just have to look long enough. In the back room you can look out to one of the channels, which makes this place even more special. I would like to be a professional travel writer. What’s your advice? Jeroo & Gustasp Irani are the rockstars of Indian travel writing. Warm, gentle and amazing in their dedication to their profession, the couple boast a resume that reads like a travel writer’s dream. We met them in Spain, and requested them to share nuggets from their wealth of wisdom. Read and be inspired! Be professional and that includes how you write, your dealings with editors and while on assignment. Use words to communicate; not to impress or confuse. Use images and enthusiasm rather than adjectives. For instance, instead of saying ‘a beautiful church,’ talk about how its reflection crinkled in rippling waters. Instead of saying you saw a tiger kill, describe it: the tearing of raw flesh – the stirring of primitive savage instincts you did not know lurked within you. When recording history, especially up front in an article, remember you are writing a travel piece, not a history book. Of course, if there is an interesting anecdote then go ahead and use it. Avoid lazy writing, such as listing things one can see and do. Talk about the experience. When on assignment, get involved… dig into local food, culture, adventure activities. It adds punch to the story. Know the publication you are writing for and write to their specifications. If you are invited on a press FAM (Familiarisation Trip), respect others on the trip and your host. Avoid being late and remember: this is not a holiday but an assignment. Travel writing and photographs go hand in hand: you can’t have one without the other. So if you don’t have a camera, make sure you know where to get stock pictures to illustrate your article. A fancy camera does not give you the right of way: the point-and-shoots have equal rights to taking pictures.